Not everyone has a massive backyard just waiting to be developed into an summertime oasis of fun. Luckily though our team of designers has been working with yards of all sizes and grades so we can build your dream design – no matter what your yard starts out as. 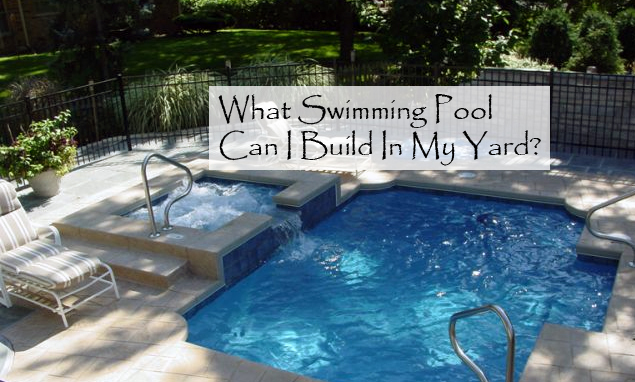 Our first question is almost always, “What do you envision in your backyard?” For some customers, the answer comes quickly and many people these days even refer us to their Pinterest pages or swimming pool photos they have clipped from magazines. For customers who aren’t as prepared, we have no shortage of images on our walls as well as computer and also encourage customers to check out our gallery of past swimming pool designs found on our website. After talking with the customer and getting an idea of what their dream pool design looks like we work to take the dream and turn it into a reality by taking into consideration yard limitations such as the grade and soil composition of the yard, size of the lot, existing vegetation, and of course local building codes that may impact one or more design elements. It is very rare for us to tell a customer we can’t help them. For instance, most pool designs can be scaled to fit a smaller yard and yards that aren’t flat can often have terracing installed so that the hot tub may be slightly above or below the main pool for both an aesthetic as well as functional balance. Ready to learn more about how we can help make your dream pool design a reality? Email us a time that you’d like us to give you a call so we can learn more about how we can help!